Love said after Monday's 107-104 win over the Knicks that he would play Wednesday against the Nets, Marla Ridenour of the Akron Beacon Journal reports. 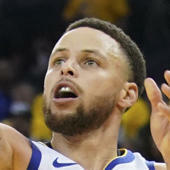 In his return from a 50-game absence following toe surgery Friday in Washington, Love played only six minutes before sitting out the second half of the back-to-back set Saturday in Indiana. He returned to action Monday and produced 14 points and nine rebounds before being pulled for the game when he hit his 16-minute. It's encouraging that the Cavaliers are comfortable enough with Love's health to use him on consecutive days, but don't expect his playing time to pick up -- if at all -- from the amount he played Monday. Marquese Chriss should still be in line for a fairly sizable role off the bench as Love's primary backup at power forward.